For the past few months, it seems like one of the most popular dead horses to beat is that of the idea of Zack Snyder’s fabled cut of Justice League. Now, whether you believe he left the project willingly or was forcefully removed by Warner Bros. and replaced by Joss Whedon is a discussion for another day, but it’s become apparent to all that those two men likely would’ve assembled two remarkably different final cuts. To be sincere, I did like the film we ultimately received in theaters, but I more so just viewed it as an entertaining action flick that just so happened to feature my favorite characters. Upon taking in Whedon’s quip-ridden dialogue that’s often cringe-worthy, though, I can’t help but wonder how things would’ve played out had Snyder stayed on. 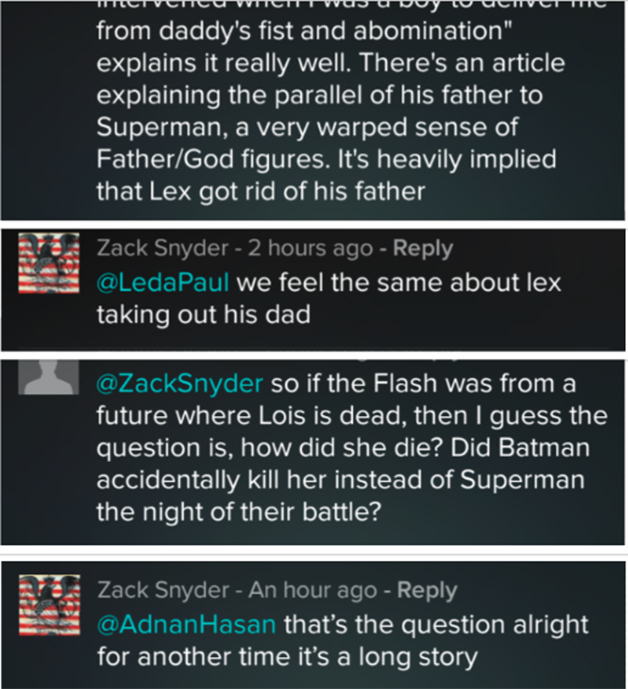 Additionally, we can’t ignore all of the intriguing trivia that a newly loose-lipped Snyder has been dropping online as of late, the latest coming in the form of a discussion he had with fans over on Vero. As you can see below, the director hints that he’ll provide the answer at “another time,” suggesting he may one day share his original plans for the pic. Now, while I do hope that Snyder’s cut of Justice League sees the light of day just as Superman II: The Richard Donner cut once did, I know better than to hold my breath. Still, even if WB decides to proceed with a sequel down the line, it more than likely will have nothing to do with what Snyder once had in store. Regardless of that, it’d be nice for him to be able to tell all at some point. On the other hand, I can picture myself breathing a sigh of relief that Snyder was given the boot if indeed he admits that killing off the Trinity – Batman, Superman and Wonder Woman – would’ve happened at the end of his second Justice League picture. It would’ve been fine for a standalone graphic novel and paid tribute to what happened in Earth 2 #1, sure, but it would’ve been counterproductive to establishing an ongoing cinematic universe – not to mention leaving a bad taste in the mouths of moviegoers.